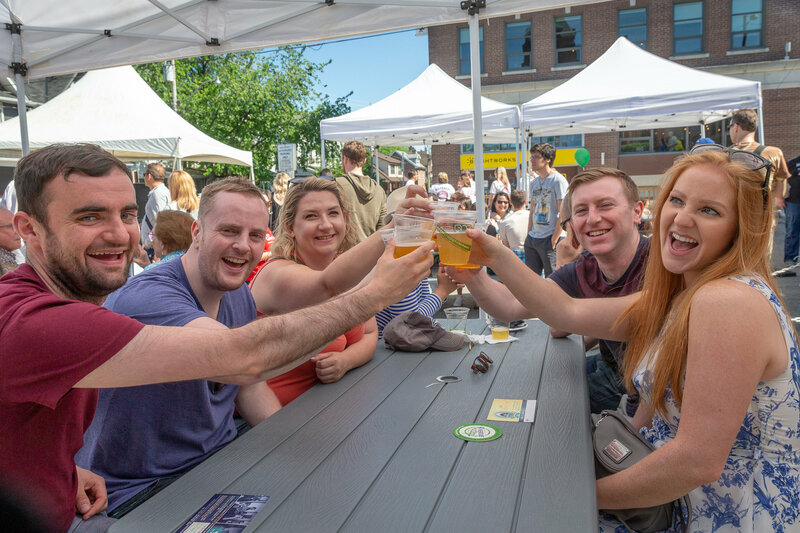 Featured: Thank You & Gallery from Riverside Eats & Beats Streetfest; Riverside Culinary Walk is June 16th; Welcome Back Pulp Kitchen! 500 pints poured in our Eastbound Brewing Co. Beer Garden – a new activity for the festival!! This event could not have happened without the support of so many amazing folks…THANK YOU to every one of you!! Check out our BLOG & full PHOTO GALLERY which gives a big shout out to all! After extensive renovations on their new space at 689 Queen St E, Pulp Kitchen re-opened with a soft launch on June 2nd for Riverside Eats & Beats! They are now open for business and welcoming everyone to check out their new space and menus. Pulp Kitchen owner Alex shared that there have been lots of changes made, beyond the new address and look. They will be open 9am to 9pm to serve breakfast, lunch and dinner. They are revamping their menu to include a Sunday brunch (coming soon!). They are even applying for a liquor license to be able to offer a new twist on their smoothies. Of course, they have their always popular menu of smoothies that their customers know and love. Please drop by and say hi and check them out, while picking up your fave smoothie or juice! Sounds of Leslieville & Riverside Block Party: Will You Take Part? Join in the fun with a new festival on the block – it’s the Block Party at Sounds of Leslieville & Riverside!! We’re so excited to partner with the Beaches Jazz Festival to further extend the celebrations into Riverside this year. In addition to the great festivities for Sounds of Leslieville & Riverside in Jimmie Simpson Park, there’ll be an amazing line up of FREE live music at Riverside street closures on De Grassi, Saulter and Boulton, paired with sidewalk specials and food tasters from Riverside’s local restos and shops along Queen St East! On Saturday, July 7th and Sunday, July 8th, 2018, the Riverside BIA will have a permit to hold a Sidewalk Sale in conjunction with the ‘Sounds of Leslieville & Riverside’ event, a part of the Beaches Jazz Festival’s 30th Anniversary celebrations. Sidewalk Sales: The Riverside BIA’s permit will enable local businesses and approved vendors to animate the sidewalk space along Queen Street East from Davies to Empire Avenue, while maintaining a minimum clearance of 2.13 m from the face of the curb for unimpeded passage of pedestrians. Outdoor Food Tasters: If providing food/drink as part of your sidewalk sale you must complete and abide by Toronto Public Health Form pg 2-5 (pls email completed form to marketing@riverside-to.com by JUNE 20th and we will submit). At no time will Queen Street East be closed to traffic, however, there will be partial street closures of Boulton, Saulter and De Grassi streets within the Riverside BIA for the purposes of live music as part of the ‘Sounds of Riverside & Leslieville’. If you would like to take part in the Sidewalk Sale with either product or food specials in your sidewalk space or if you have any questions or concerns, please contact Jennifer at marketing@riverside-to.com or 416-466-8167. The Riverside BIA summer planters are being installed today! Thanks to the fab gardeners at Parkdale Greenthumb. You’ll be seeing these gardeners around quite a bit as they water, weed and maintain beautiful planters for the BIA on a weekly basis throughout the summer and fall. It’s Men’s Health Week June 11th to June 17th. Local studio Framewrk is parterning with Men’s Health Network to offer a free Men’s stretch class June 15th, 7pm – 8pm. This class is open to all men (members or not) and will teach stretching basics and provide an hour of detailed, hands on stretch basics. Space is limited so please book today through this link. The Ralph Thornton Community Centre is hosting its Annual General Meeting on June 13th – you are welcome to join in at 5:30pm for registration and light dinner, and program begins at 6:30pm. In addition to the business of the Community Center, they will have special guest Clive Veroni to speak about: The Enthusiasm Gap – Why are the good guys losing group, and what can we do about it? To RSVP, pls contact 416-392-6810 or email info@ralphthornton.org.